Look around – can you SPOT one thing that is not safe? What if everybody could SPOT one thing that is not safe each and every day? Wouldn’t we be so much better off? I find that employees do SPOT things that are not safe but typically do not say anything. Why? First, they believe that nothing will be done about it. Second, they feel it’s not their job, and third, they feel that somebody else will take care of it. How do we change this going forward? If we have leaders (managers, supervisors, leads, etc) that will do nothing about something that is not safe – it’s time to get new leaders! Safety should be the first priority of any leader. We have an obligation to provide a safe workplace. Any safety issue – no matter how minor – needs to be addressed. We need to ensure that every employee feels comfortable reporting any safety issue that they SPOT. We need to change our culture. We need every employee to understand that safety is their job. We want every employee to go home in the same condition that they came to work. We want every employee to understand that it’s their responsibility to report any safety issue that they SPOT, no matter how minor. We need to create a culture where it is unacceptable to not report it. This is a really a simple concept – it just requires trust and accountability. I am going to encourage every employee to SPOT one thing that is not safe each day – what about you? When it comes to safety – you need to have PASSION. Employees know when you are going through the motions and “just complying” or “checking the boxes”. When you inject PASSION into what you are doing – you are a believer and it shows – others start to become believers as well – others start to have safety PASSION. This is how we create the right safety culture. We don’t have to have all the answers – we just need the PASSION to find them. How often do we come across the manager who knows everything? The manager who has done it all? This is the same guy who rules with an iron fist and employs the “my way or the highway approach”. You will be hard pressed to find PASSION in this style of management. Rather, this style of management is more prone to politics and excuses. I encourage you to display true PASSION at your next safety meeting. Watch out – it will become contagious! I am passionate about safety and truly feel that these items are the answer to WHY BOTHER WITH SAFETY? I take safety very seriously and feel that it is a worthwhile cause. It is unacceptable of any employee to be injured at work – regardless of the circumstances. I think its pretty straight forward – what about you? It’s that time of year when the weather heats up and employees wonder why they cant wear SHORTS to work. As an employer, we have an obligation to provide a safe working environment. We have an responsibility to conduct a hazard assessment and protect our employees. As such, many of our facilities handle thin aluminum and steel sheets and fabricated parts and we have determined that there exists a moderate cut hazard. Therefore, SHORTS are not permitted. I had a lengthy discussion with a couple of safety experts that have been in the safety field for over 20 years each. Both of these individuals are in consulting roles and have seen hundreds, if not thousands, of businesses. In their opinion, only companies with weak safety programs allow SHORTS in the workplace. Further, their recommendation is for us to not wear SHORTS based upon the materials that we work with. We have made some leadership changes in our Human Resources department over the past few months. The new individuals in this department are traveling to all of the facilities learning about our business and talking to employees. One of the items that has been coming up consistently is SHORTS. After their first visit, we explained how we conducted a risk assessment and had discussions with safety professionals on the subject. Rather than explaining this to the employees, the human resources leadership is telling employees that they will look into it. Why? They are providing a false hope to the employees and, in my opinion, undermining our safety program. I take my obligation to provide a safe working environment seriously. It is unacceptable of any employee to be injured at work. Further, in conducting a hazard assessment of the workplace, it has been determined that SHORTS should not be worn. I think its pretty straight forward – what about you? We have kicked off a risk assessment tool at a couple of our facilities over the past few months. This tool is very powerful and allows us to take a laser approach to safety. I have decided that we will kick off a little friendly COMPETITION between a couple of our facilities. This COMPETITION will create a little excitement and rivalry amongst the participating facilities. The risk assessment tool takes a targeted job and assigns a score (1-25) based upon severity and frequency. Improvements are brainstormed and a new score is assigned to the targeted job. The goal is to move the meter on the targeted job and eliminate risk (severity x frequency). The COMPETITION between the facilities will enable us to target risky areas and make them safer. The winning team will receive a cookout for all employees at that facility. If we have the COMPETITION once per month between two facilities – we will reduce 24 targeted risky jobs in one year. I’m all in favor of a little friendly COMPETITION – What about you? Why look at safety this way? Some facilities are very lucky and have no accidents – therefore we think they are safe. Some of these facilities do not participate, have poor leadership, have a poor culture and are not committed to safety but their incident rates look favorable. Some facilities have poor incident rates but have very good participation, very good culture, are committed to safety, and have good leadership but have had incidents. Which facility is better? In my opinion, I will take the facility that has incidents but good culture, commitment, leadership, and participation over the facility that is incident free but lacks these characteristics. I believe that the latter is a time bomb waiting to explode! We don’t have a system in place to identify the time bomb by looking at incident rates only. I’m curious to obtain your opinion on a MEASUREMENT system like this – what have I missed? The most effective safety program is when safety becomes a value to the organization. It’s easy to say that your organization values safety – it’s another to walk the talk and truly have safety as a core value of your organization. The second level is when one becomes the owner of safety – it creates accountability. A safety program with engaged employees is more effective than a program with involved employees. A program with involved employees is more effective than a program with interested employees, etc. In my experience – many organisations become complacent with their safety efforts. Avoidance is another failed safety strategy that many companies have tried. The wait and hope safety effort is a ticking time bomb. It’s time for companies who operate with these ineffective safety efforts to wake up and climb the ladder. We will continue to climb the ladder until safety becomes a core value of the organization. 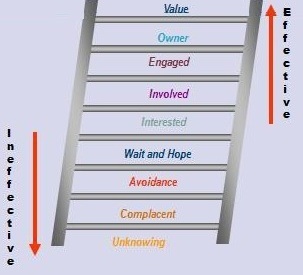 Where is your organization in the HIERARCHY of safety?